What? Jessica Alba as Sue Storm… she’s too young! Johnny Storm needs blonde hair! Mr. Fantastic looks so dull. Okay the rock man suit looks alright on the Thing. Those were my criticisms upon first seeing the Fantastic Four’s publicity photo almost a year before the film hit theatres. The truth would come soon enough when celluloid finally hit the silver screen and the movie magic was made. Marvel Comic’s latest film adaptation comes from one of its oldest franchises. These heroes have had a long road to the big screen. This is actually their second movie, the first was considered to be so bad it was never released. But this film was worth the wait. 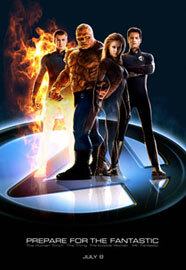 The movie starts by introducing the five main characters. Dr. Reed Richards (Ioan Gruffudd) and his colleague Ben Grimm (Michael Chiklis) approach industrialist Victor Von Doom (Julian McMahon) about a scientific research mission using his company’s space facilities. Von Doom agrees. The catch, he wants to be part of the research. Enter his lovely assistant Sue Storm (Jessica Alba) who immediately has conflict with Richards who is his jaded ex lover and currently admired greatly by Von Doom. The final member to round out the cast is Sue’s brother Johnny (Chris Evans). The introduction of the characters is great, detailing their personalities perfectly. It is Evans, though, who easily steals the show. He is not only the comic relief, but his antic actually help to move the plot along. There’s nothing groundbreaking here. You get to root for the good guys, boo at the bad guys and enjoy your popcorn. This is what action movies are all about. And there is plenty of action. But if you’re looking for something deeper there is that too. Unlike the X-Men who must hide their abilities from the public, or Spider-Man who has to deal with growing up while also fighting crime as a super powered vigilante, the Fantastic Four are public with their powers, giving TV interviews and marketing themselves to the public. Their characters develop as they learn to deal with their powers. Reed and Sue are forced to resolve open romantic issues, The Thing must adapt to life as a rock monster and Johnny Storm… well let’s just say that the Human Torch can be a real hot-shot! Thus the film works on the superficial and the interpersonal levels, with a classic plot about good versus evil and two guys fighting over a pretty girl (who happens to take her clothes off in public… did I mention her power is to turn invisible?). Enjoy this movie’s action, comedy and romance. It makes you feel good to root for really good good guys and boo the really bad bad guy.